"The appalling thing about fascism is that you've got to use fascist methods to get rid of it." Can a normal, reasonable, caring human being be transformed by the right circumstances into a fascist? From the perspective of free speech and choice, it's easy to suggest that willing capitulation to fascism is both unlikely and even fanciful, but its roots are firmly seated in prejudice and cultural hatred, something that even today is a too common phenomenon. It has even been suggested that such attitudes are embedded in each of us, just awaiting the appropriate trigger or a speed-up in the process of intellectual devolution. Consider the following two experiments. In 1992, Oprah Winfrey – yes, that Oprah Winfrey – hosted a show in which the studio audience was divided before entry and treated either shabbily or politely, depending on nothing more than the colour of the eyes. Once installed in their seats, they were informed of a (false) theory that those with brown eyes were intellectually and socially superior to those whose eyes are blue. In a matter of minutes, brown eyed audience members were supporting the theory with tales of the stupidity of blue-eyed acquaintances and even telling blue-eyed jokes to illustrate the same. The purpose of the show, of course, was to illustrate how easily prejudice is learned. What surprised most watching, myself included, was just how quickly this happened and how eagerly it was embraced. More troubling conclusions about our fragile humanity were reached by the famous Stanford Prison Experiment in 1972, in which a group of volunteer college students were cast in the roles of prisoners and warders in a realistic prison environment for a period of two weeks. The experiment had to be stopped after only six days because of the very real threat posed to the health of those in the role of prisoners, due largely to the unexpected speed with which those cast as warders had learned to abuse their power and brutalise their captives. Over in the Abu Ghraib prison in Iraq, this very same behaviour caused recent worldwide outrage. To suggest that the American service personnel involved were fascist by nature is absurd, but that they too easily, given the wrong circumstances, learned fascist behaviour is food for sobering thought. These circumstances may be extreme, but what if that fascism was presented as a reasonable argument, as a seemingly logical response to extreme circumstances? And what if your life, your family were threatened if you chose not to cooperate? You may be reluctant, you may even be sickened, but how far would you go to protect both? I'll tell you this, you don't know. I don't know. None of us who have not been in that situation know. We can only speculate. Most film enthusiasts will know the name of Kevin Brownlow for his tireless efforts, usually in partnership with David Gill, to restore classic silent films and present them for big screen showing, often as special events at film festivals. I will forever be in his debt for his work in reviving Abel Gance's astonishing Napoleon, which remains one of the most electrifying experiences I have ever had in a cinema. As a director, his work has been primarily linked to this vocation, documentaries and television series on silent cinema and film restoration. There was one exception. Way back when he was just 18 years old, he and his 16-year-old friend Andrew Mollo started work on a project that was to take eight long years to complete and then immediately run foul of the censors. The film was It Happened Here. Brownlow and Mollo present us with a chilling supposition, a vision of what 1944 Britain might have been like had a successful German invasion taken place four years earlier. Initially active resistance has now been effectively crushed and the population at large has become reluctantly accustomed to the presence of its new overlords. For most British citizens, there is little choice but to accept the situation in which they have, by this point, been living for so long, and many are openly cooperating with the invaders to establish a National Socialist order, the 'Immediate Action' organisation. The touchstone for this is clearly post-1940 Vichy France, which as well as operating under Nazi direction was also fighting a civil war against communist and republican elements in its own country. The situation here is much the same, with communism used as a brush with which to tar the uncooperative or the resistant. It is this element in particular that lifts the film out of its historical context and provides a pointer to its continuing relevance, a cautionary tale of how fascism can take hold in even the most democratic societies – all you need is a little prejudice and some economic hardship and the flames of intolerance are ready to be fanned. It triggered oppressive legislation in McCarthy era America, it put members of the British National Party in council offices and even helps sell newspapers to those whose bigoted attitudes helped to elect them. It is this aspect around which the film's storyline revolves, its central character Pauline being a nurse who, in order to find work, has to do so within the ranks of the Immediate Action group. Initially reluctant, she becomes increasingly seduced by the lifestyle changes it brings and by the propaganda with which she is regularly fed. This gradual separation from her own past brings her to the point where she has to choose between her friends, who are secretly aiding resistance fighters, and her newly programmed attitudes. Her final awakening to what she is participating in comes too late for her – by then she is on the wrong side of a moral divide that has no easy crossover point. 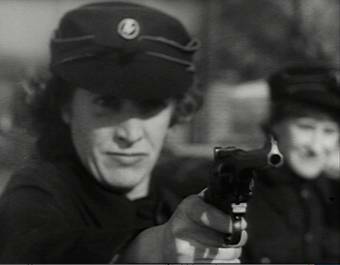 It is Pauline's indoctrination period that caused the film its biggest problem on its release, and specifically a scene in which she attends a meeting in which the fascist viewpoint is put over, not by script-fed actors but by real-life members of the British National Socialist Movement, who respond to questions with genuinely held opinions. Brownlow and Mollo were looking for realism and they got it, and the scene makes for disturbing viewing. It's as clear an illustration of why fascism should be opposed as I've seen in a British film – I've yet to show this sequence to someone who hasn't recoiled with disgust at the views being expressed (asked what you should do if you found you had one eighth part Jewish blood, one of those leading the discussion says casually "I suppose I should say I'd cut my throat and let the Jewish blood out"). It was clearly Brownlow and Mollo's intention to give these people the rope with which to politically hang them themselves and they willingly oblige. And yet on its release the film was accused of anti-Semitism and this scene specifically of promoting fascist ideals and it was removed as a result. Brownlow and Mollo, who firmly believed they were making an anti-fascist film, were mortified, and today the very idea that it could be read as anything else seems absurd. Presumably the BBFC now believe likewise, hence the passing of the film uncut for this release. The film's real power comes from its technique, presenting much of the action in utterly convincingly documentary style, feeling at times very much as if it was filmed on location in 1944 and that this all really took place. This docudrama technique could almost be seen as a natural extension of the social realist cinema of the late 50s and early 60s, although the concerns are more 'what if?' than a kitchen sink reflection of life as it is. 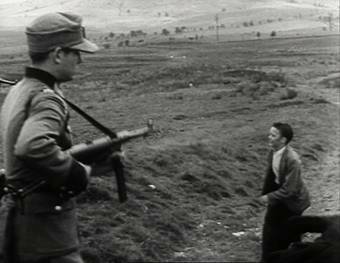 This technique was used sparingly in British cinema, perhaps the most celebrated exponent being Peter Watkins, whose 1965 The War Game could be seen as a stylistic companion piece, one that also fell foul of censorship (in Watkins' case a complete ban). It signifies a long-standing issue those in power have with the docudrama format, which presents fiction in a manner that they argue could be taken as factual. You may not think that could be an issue with a film that imagines an invasion of Britain that we all know did not occur, but I have personally had discussions with young students for whom history begins somewhere around 1980, and who returned from seeing Titanic with the astonished cry, "You won't believe this – the ship hit an iceberg and sank and all these people were killed!" They, of course, are the very people who should see this film. Authenticity and realism are always the key factor here. Particularly astonishing are the scene-setting montages of London life, in which German soldiers chat cheerily with locals, casually interract with such recognisably British wartime icons as policemen and air raid wardens, travel around like tourists on London buses, and take holiday snapshots on the steps of the National Gallery and the Albert Memorial. This matter-of-fact placement of German military iconography in recognisably English settings frequently throws the familiar into the realms of the surreal, but is nonetheless made to feel real though the cinematic technique. This is especially felt during the authentically shot, scored, voiced and edited (complete with visible tape joins) newsreel 'Mirror on the World', which sings the virtues of Anglo-German cooperation, twists the impromptu pacifism of the Flanders Christmas day trench truce of WW1, and demonises communist resistance and "the terrible deadly grip of the Imperialist Jews." It's a chilling, politically charged sequence in a film that still packs an extraordinary impact and deserves to be far more widely seen and celebrated. From any perspective, the film is a remarkable achievement, and your appreciation is further boosted when you discover that every shot in the film was created by the young Brownlow and Mollo – there's not a frame of archive footage in here. It's message remains as fresh as it ever was and, and while too often unheeded, for what it says and the skill with which it is communicated, It Happened Here stands as one of the finest, most important British films of the past fifty years. Shot on a mixture of 16mm and 35mm on what looks like high speed black-and-white stock (and, let's not forget, on a microscopic budget), a degree of grain and occasional picture softness is inevitable, and may even have been intended, as this adds to the 1940s newsreel feel that is so crucial to the film's striking authenticity. For much of the film, notably the sequences shot on 35mm, the level of detail is good, and although the contrast level is quite high, this again works for the feel of the film and is almost inevitable when working with high speed stock. There is some dirt and occasional damage, but this does not interfere with the viewing experience. Given the source material, this is a solid enough transfer. The sound, surprisingly, is Dolby 2.0 surround, but don't let that tag fool you – this is essentially a mono track and as such both appropriate and faithful to the original film print. The directors and their crew were working with less than cutting edge technology, and the sound recording reflects this, though once again this adds to the documentary feel. Although displaying some minor hiss in places and a very audible pop on some reel changes, it is otherwise clean and a very serviceable job. Newsreel Within the Film – Original Cut (9:48) is just that, a full version of the 'Mirror on the World' newsreel seen in the feature, and contains some shots not used in that version. It is preceded by brief notes by Kevin Brownlow. The American Theatrical Trailer (2:10) is of real interest, in no small part to the fact that United Artists spent more on it that Brownlow and Mollo did on the film it is promoting. 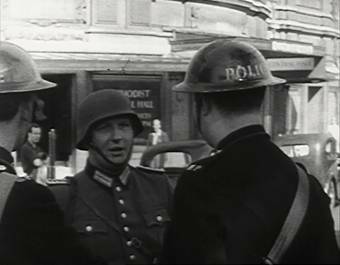 There is a selection of 6 Photographs of Occupied Paris, taken from the book A Paris, sous les bottes de Nazis published by the resistance in 1945, which Brownlow admits were a key influence on the look of the film. The pictures are reproduced close to full (4:3) screen. There are also 12 Production Stills, reproduced at similar size and quality. It Happened Here is a still extraordinary work that deserves to reach a wider modern audience than it probably will. It should certainly be compulsory viewing for film student wannabes as an example of just what can be achieved on a tiny budget if you really are prepared to devote your life to your film, and frankly if you're not then you've probably already made the wrong career choice. The making of the film is a story in itself, and to that end Bronlow's sleeve notes point you to his book, How It Happened Here, which fascinatingly chronicles the film's arduous production and comes highly recommended to anyone to enjoyed the film. Film First's region 2 DVD showcases the film as well as you're likely to see it, and just tops Image Entertainment's region 1 with the inclusion of a couple of interesting extras, though we are left aching for a commentary or documentary on this one.